The Edwards family are on hand to ensure you of a warm welcome in our comfortable and relaxed home. Traditional furniture enhances the character of each of the nine spacious bedrooms. 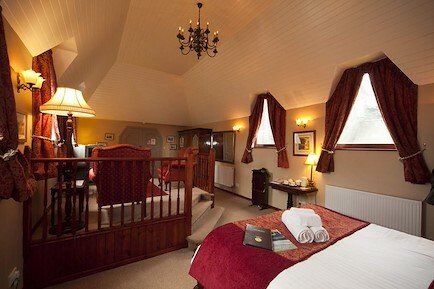 Three of the bedrooms have luxurious four poster beds. All bedrooms are en-suite with a choice of bathroom or shower room, and all have colour freeview televisions, wi-fi access, radio alarms, tea/coffee making facilities and hospitality trays. The generous full English breakfast (or vegetarian option) will set you up for the day, whether walking, climbing or sightseeing. After the day's exertions you can relax in the elegant and comfortable lounge, or enjoy the hotel's award winning, attractive gardens and conservatory. Acorn House Hotel has a non-smoking policy and I'm afraid we cannot accommodate pets. From the A66 enter Keswick at the first turning. At the T-junction turn right and follow Penrith Road until you go past Fitz Park and go up a slight incline. At the top take a left turn opposite the war memorial and then an immediate second left beside Cumbrian Properties. Follow Southey Street to the end of the road and Acorn House Hotel is in front of you. Your enquiry will be sent directly to Acorn House . Please fill in as much detail as you can.